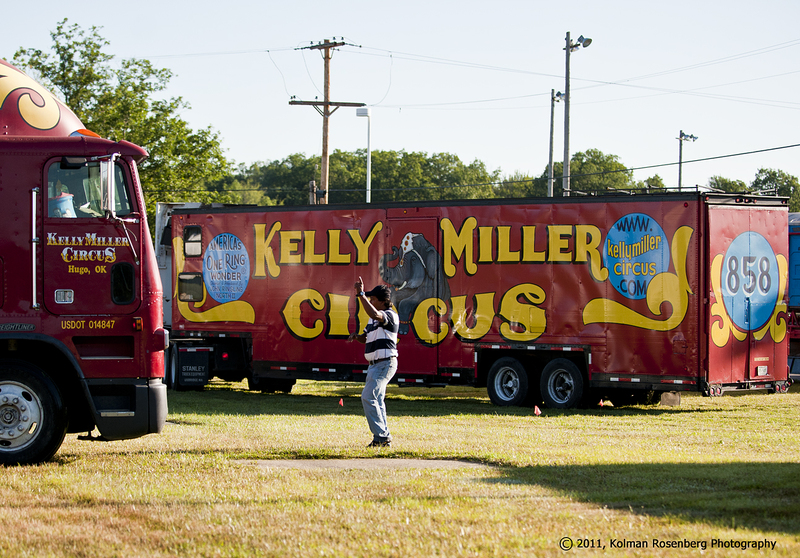 The Kelly Miller Circus arrives this morning in Middlefield, OH. 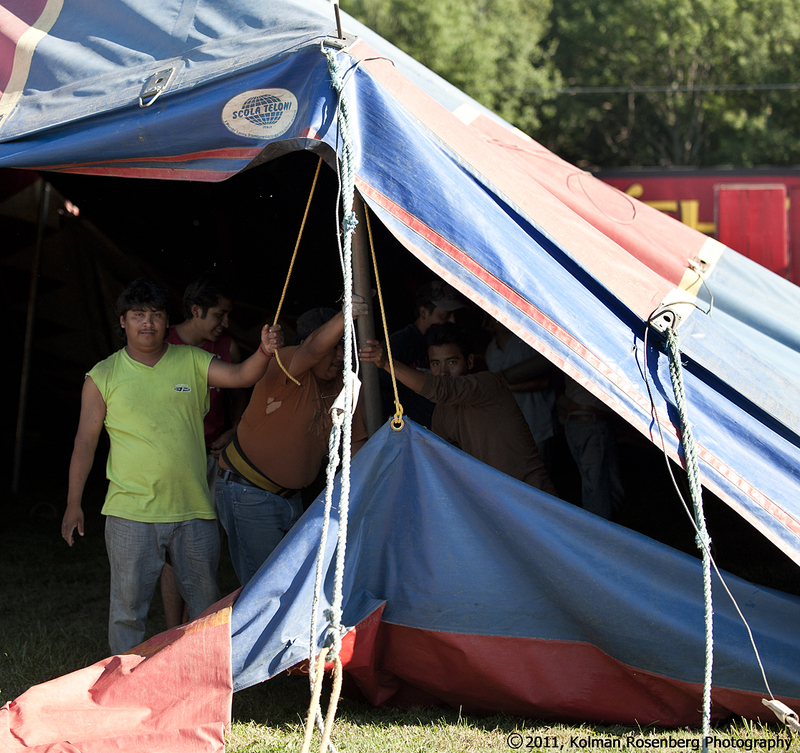 This morning the Kelly Miller Circus arrived in Middlefield, OH. This family friendly circus with approximately 85 employees, travelling in 35 vehicles, took only 2 1/2 hours to arrive, unload, and setup. It was quite an impressive demonstration of teamwork and cooperation between man, machine and animal. Few words were spoken, mostly hand signals and whistling were used to communicate while the community was welcomed to stand by and watch the open field transform into a circus midway. 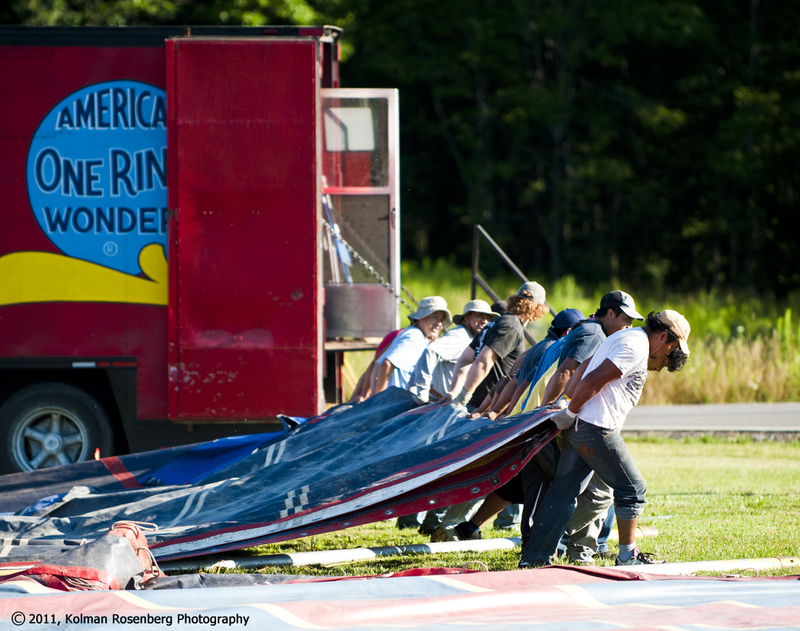 Circus workers unload and lay out the tent. 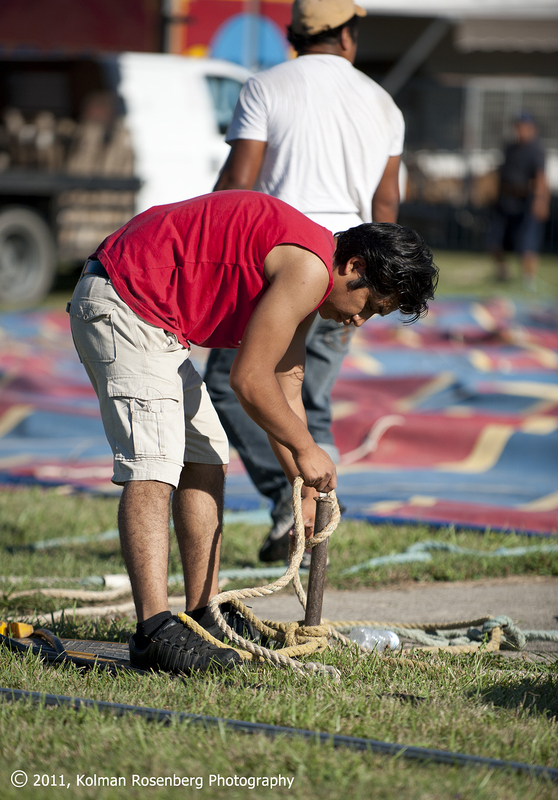 A circus worker ties a tent rope to a stake. While the tent is being set up, other workers setup the concession trailer, and tend to the animals. 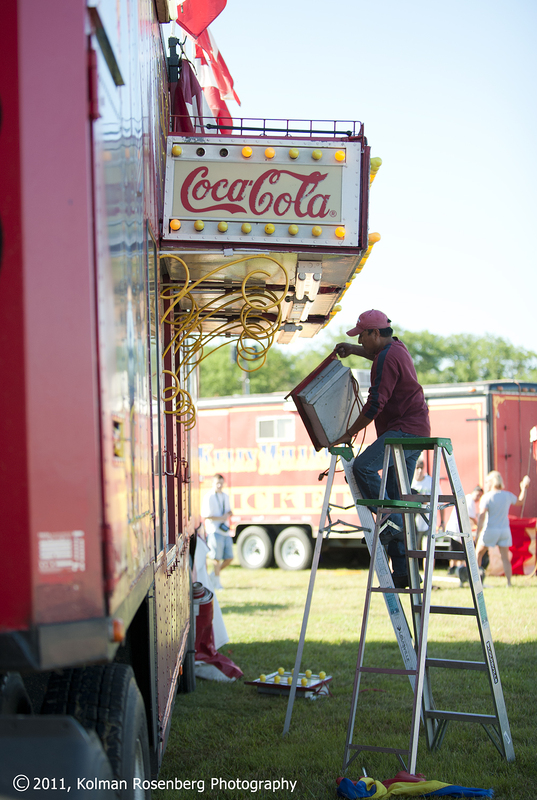 A circus worker sets up the food concession trailer. Workers start to raise the sides of the tent. As the tent starts to go up around the edges, one worker climbs on top and adjusts some of the poles and lines. 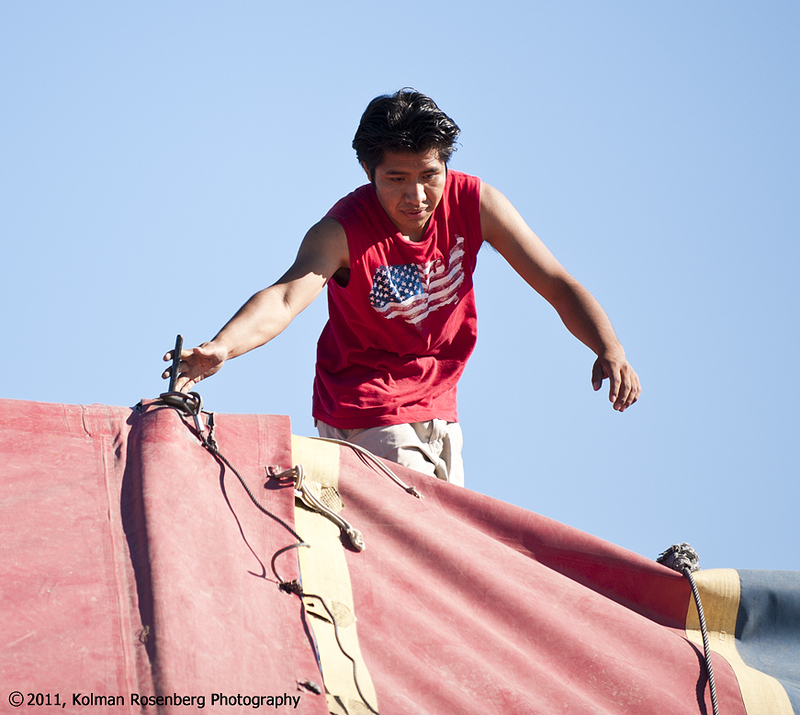 A circus worker adjusts tent poles and lines from the top of the tent. Finally, the sides are raised and the main tent poles are ready to be put into place. Getting ready to raise the main tent poles. 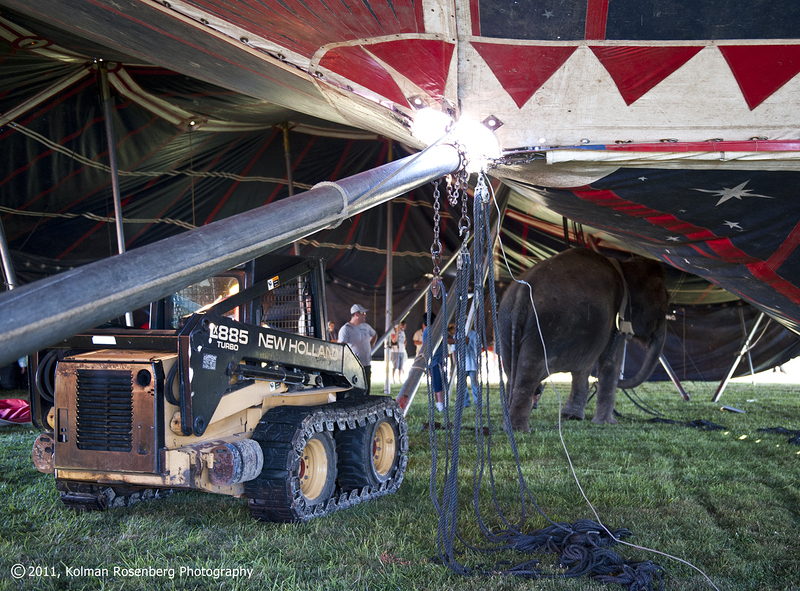 Lisa, the elephant, with the assistance of a small tractor, get ready to raise the main tent poles. Once the main tent poles are raised, Lisa and her trainer appear to have a short conversation. Their heavy work is done. Lisa and her trainer, their heavy work is done. Once the tent is raised, more work awaits. Grandstands are trucked into the tent, the ticket window goes to work, camels, tigers, horses and elephants are fed and groomed and another day for the circus workers takes shape. Yesterday they were performing in Pennsylvania and after tomorrow’s shows they will move on to another location. It’s an incredible process done extremely efficiently and well. 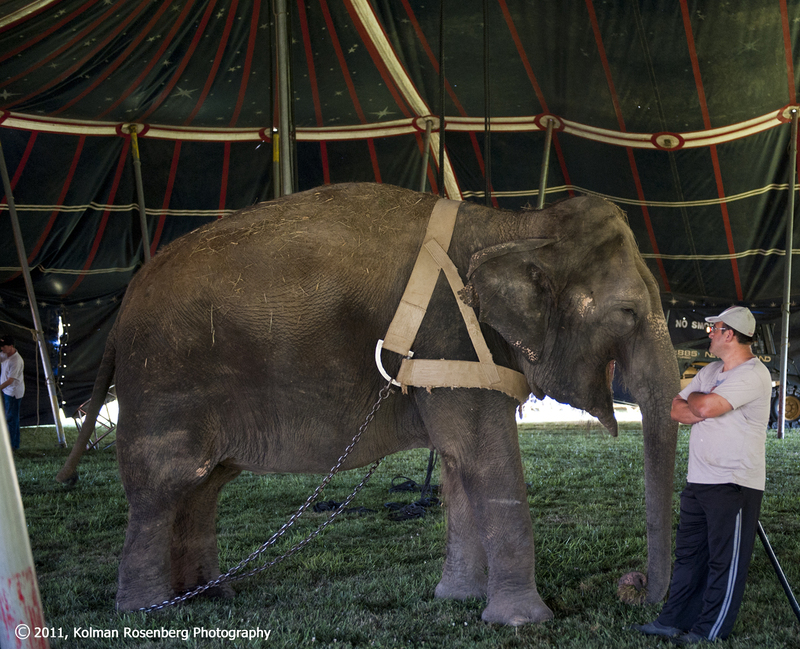 This entry was posted in Uncategorized and tagged circus, elephant, kelly miller circus, middlefield, midway, ohio, tent. Bookmark the permalink. Thank you for that peek under the big top. Literally had a few under the big top! Wouldn’t be great if our Government could work together like this and get things done. That’s what I was thinking the entire time, in fact I told one of the circus workers they should invite congress to come watch how they work together to get the job done! See my Facebook comment Bill. Thanks for commenting!